On the DSS-0156 Llama Drama screen, locate the cactus. Draw an outline around it in permanent marker. Cut it out with excess screen around the edges. 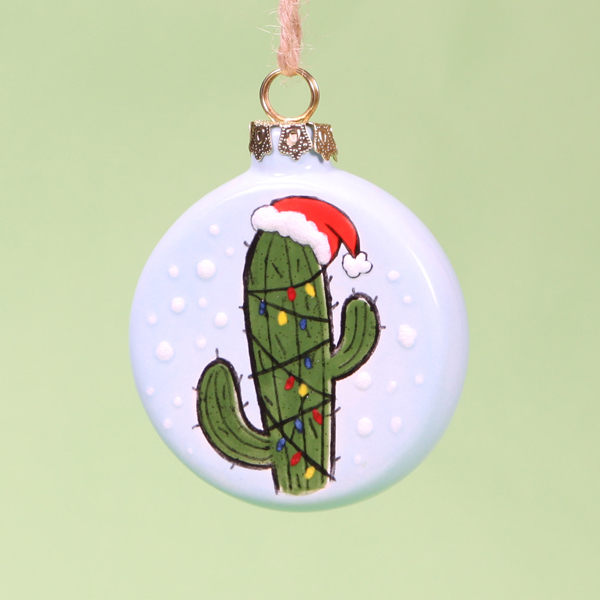 Place the cactus in the center of the ornament. While holding it firmly in place, take a small amount of premixed Silkscreen Medium, and gently rub in circles starting in the center and working outward. Slowly pull up the screen to avoid smearing. Using the pencil, draw a Santa hat on top of the cactus. Using the Script Liner with SC-8 Just Froggy, apply two coats to the cactus. Allow glaze to dry between coats. Using the Detail Liner with SC-73 Candy Apple Red, apply two coats to the Santa hat. Allow glaze to dry between coats. Using the Detail Liner, Script Liner and Soft Fan with SC-45 My Blue Heaven, apply two coats to the background, sides and back of the ornament. Allow glaze to dry between coats. Using the Detail Liner with SG-302 Snowfall, make dots in the background and fur on the hat. Using the Detail Liner with SC-15 Tuxedo, outline the Santa hat. Use SG-401 Black to make lines crossing the body of the cactus. It should look like lights wrapping around the cactus. Use SG-403 Red, SG-404 Blue and SG-407 Yellow to make lights coming off of the black lines.